The Premier Shutter and Groove kitchen door and drawer front design is the same as the Premier Shutter design but with a tongue and groove effect in the centre panel. The border on this design is 70mm. The number of vertical lines on the centre panel will vary depending on the width of the item (shown is 395mm wide). Premier Shutter and Groove drawer fronts start from £2.10. 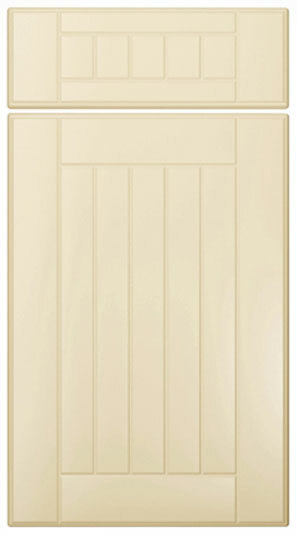 Click the button to purchase a Sample Premier Shutter and Groove design kitchen door. The Premier Shutter and Groove design is available in ALL non-gloss finishes. The Premier Shutter and Groove design is available in ALL high gloss finishes. Please Note: The Premier Shutter and Groove design is NOT available in any high gloss finishes.